Rappers Goldie Lookin' Chain are sponsoring their home city's football strip with a unique shirt design. Newport County AFC have ordered the shirts, complete with a gold chain around the collar, for the Football Association of Wales Premier Cup. The group agreed to sponsor the cup kit after being approached by fans. The players will don the new-style shirts for the cup games, which begin with an away match against Caernarfon in November. 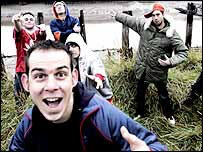 The band, known as the GLC, are currently enjoying success after the release of their album and single Guns Don't Kill People, Rappers Do, which made it into the top three. On Monday, they released their latest single, which is expected to reach a high chart position. Made up of about nine core members, the band are often joined by others to make up a stage presence of about 23. They recently signed a five-album deal with East West Records, the label which catapulted The Darkness to fame. Band member Mike Balls said the band's contribution to the shirt design was "just towards the actual medallion vibe." He added: "It was designed by the fans - one of them designed it with the medallion round the neck just for the Welsh Cup, so hopefully we (Newport) can stay in it longer than we usually do. "It's still in talks at the moment, but it's already been designed so hopefully it should be wicked." Asked how many GLC fans there were in the Newport squad, he said: "God knows, but they should all be out buying the single this week and the album of course." Rob Santwris, 42, supporter of the Conference South club, was one of those who came up with the idea of asking the band to sponsor the kits. "A couple of us were talking of trying to get more people in Newport involved with the football," he said. "The club is not in the Football League anymore and so people aren't getting as involved. So we thought about asking the GLC if we could get them on the shirts. "I asked Adam Hussain, who is a member of the band, and he thought it was a good idea and it went from there. "I haven't had a lot of contact with the lads because it has all coincided with the launch of their album and singles and they are superstars now. "But I know that they were really up for it. "They often sing about Newport - about 90% of their songs are about it so it was natural to ask them," he said. He described the shirt design as eye catching. "We wanted the chain around the neck and we decided to use the old county logo as the medallion on it. The finished design is exactly what we wanted," he added. Errea, who are one of the club's official sponsors believes the GLC will help raise the club's profile. "It's a new design football shirt in amber and black but around the neck it has a golden chain with a medallion with the county logo on it," said Nick Matthews. 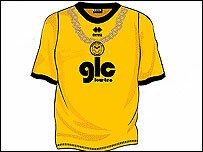 "It's a good football shirt and the chain makes it really quirky. We put the design on the club website and there has been a lot of interest in it. "The players listen to music before the games and I'm told that they listen to the GLC so they are well up for it. "I think it is a fantastic idea," he added.